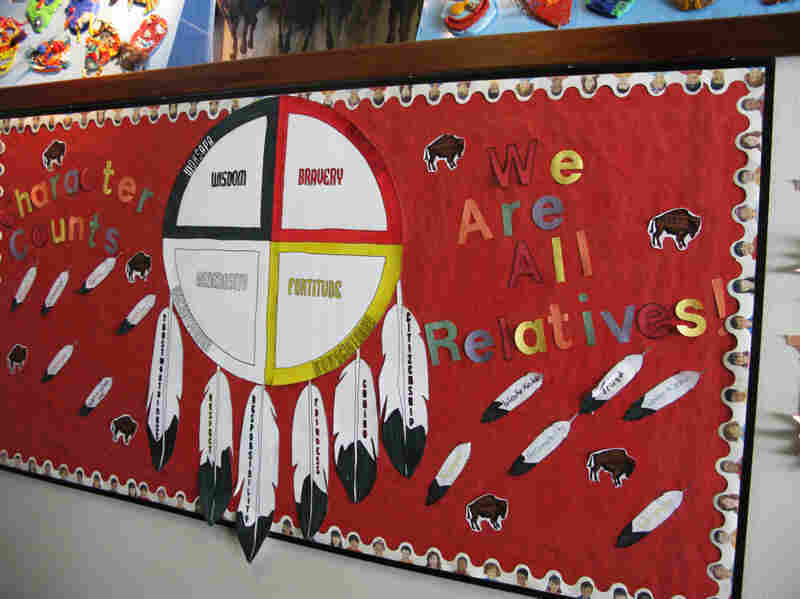 Tribes Question Foster Group's Power And Influence In South Dakota, hundreds of Native American foster children are being placed in a large private group home, which gets paid millions of dollars, instead of with family or other members of their tribes. On a small crest deep in South Dakota's Black Hills, a dozen children jumped on sleds and floated across the snow. They are wards of the state, and this is their home: the western campus of the Children's Home Society. There are rolling hills, a babbling brook — even a new school. Children's Home Director Bill Colson says it's a place to help children who can't make it in regular foster homes. "We want to solve the problems, and sometimes it just seems like you're beating your head against the wall," he says. "But the reality is we are making progress, and I feel great about it, and our agency feels good about it." State officials say Children's Home and other organizations like it are necessary. But Native American tribes say their children don't need to be there. Instead, they should be placed with their relatives or tribal members. Federal law agrees. In 1978, Congress passed the Indian Child Welfare Act, to halt a century-long practice of forcing Native American children into boarding schools. It says that except in the most extreme circumstances, children must be placed with family or tribal members if they have to be removed from their homes. But a 2005 government report found 32 states are failing to abide by the law in one way or another. And an NPR news investigation has found that in South Dakota, 90 percent of Native American children in foster care are placed in non-native homes or privately run group homes. It's a generation of children once again being taken from their native traditions and culture. At Children's Home, which is the largest private foster care provider in the state, Colson says he's heard the tribe's complaints. But he says the organization's priority is to return Native American kids to their families. "Our goal is to have kids be in a family and be successful," he says. With multiple campuses and emergency centers, Children's Home provides services for up to 2,000 children a year. It's now one of the largest nonprofits in the state. But it wasn't always. Ten years ago, this group was in financial trouble. For several years, tax records show, it was losing money. Then in 2002, a former banker named Dennis Daugaard joined the team. He became the group's chief operating officer. A year later, he was promoted to executive director. And things began to change. South Dakota Gov. 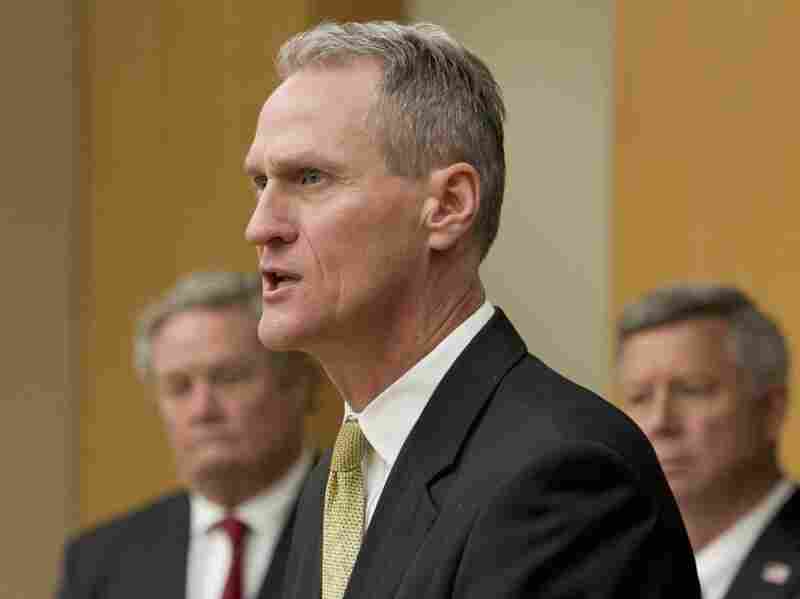 Dennis Daugaard, seen here at a news conference in October, spent seven years in leadership positions at Children's Home Society before becoming the state's governor. The money the group was getting from the state doubled under his leadership. Children's Home grew financially to seven times its size. It added two new facilities. State records show it seized on a big opportunity. The state began outsourcing much of its work, such as training foster care parents and examining potential foster homes. Children's Home got almost every one of those contracts. The group paid Daugaard $115,000 a year. But that wasn't his only job. He was also the state's lieutenant governor — and a rising star in state politics. The seven years Daugaard spent at Children's Home — and his ability to turn the place around — were prominent features of his successful 2010 bid for governor. It could be that Children's Home was the best organization for the job, at the best price for all those contracts it got. But it would be difficult for tax payers to know. In just about every case, the group did not compete for the contracts or bid against any other organization. For almost seven years, until this year, Daugaard's colleagues in state government just chose the organization and sent it money — more than $50 million in all. "It's a massive conflict of interest," says Melanie Sloan, executive director of the Washington, D.C.-based Citizens for Responsibility and Ethics in Washington, adding that any organization run by a state's top elected official would have undue power in that state. "When you're lieutenant governor, people are anxious to curry favor with you," she says. Daugaard declined NPR's repeated requests for an interview. In a statement, his office said Children's Home was the only viable organization that could have done the work, and that Daugaard never used his influence as lieutenant governor to secure contracts for the organization. Tribal leaders, though, say the unusual relationship provides a window into the role money and politics play in South Dakota's foster care system. They say the dominance of Children's Home in this area is but one example of the interests of the state trumping the interests of native children. "They make a living off of our children," says Juanita Sherick, the tribal social worker on South Dakota's Pine Ridge reservation. She says the state pushes aggressively in her cases to place kids in Children's Home who, she says, should be placed with their grandmothers, aunts and uncles — family members who are often desperate to take them in. "Give the children back to their relatives, because the creator gave those children to those families," Sherick says. "Who has any right to take them away from those families?" In recent years, critics say Children's Home has become a virtual powerhouse. It not only examines all the potential foster families and homes, it houses the most children. It trains the state's case workers and holds all of the state's training classes for foster parents. It does all of the state's examinations of children who may have been abused. For all of this work, Children's Home is paid tens of millions of dollars every year. On the Standing Rock Sioux reservation, tribal social worker Rose Mendoza finds that ridiculous. Children's Home got the state's only contract to examine potential foster homes, called kinship home studies, even on the reservations. Children's artwork lines the halls of the Children's Home Society in South Dakota. Officials there say they try to keep Native American kids connected to their culture. "Why send a private agency onto our reservation?" she said. "[Children's Home] is not calling us to request permission to come onto the reservation to do these home studies." Mendoza says her agency would do the work for free. They know the families, they know the homes. In a state where the majority of foster children are native, Mendoza and many of their tribal officials say home studies, social worker training and family placements should be done by people who know and understand the children's culture. "Everybody says cultural differences," Mendoza said. "But it's really understanding what that means. It's a way of life. Our way of life is different." Tribes weren't the only ones left out. 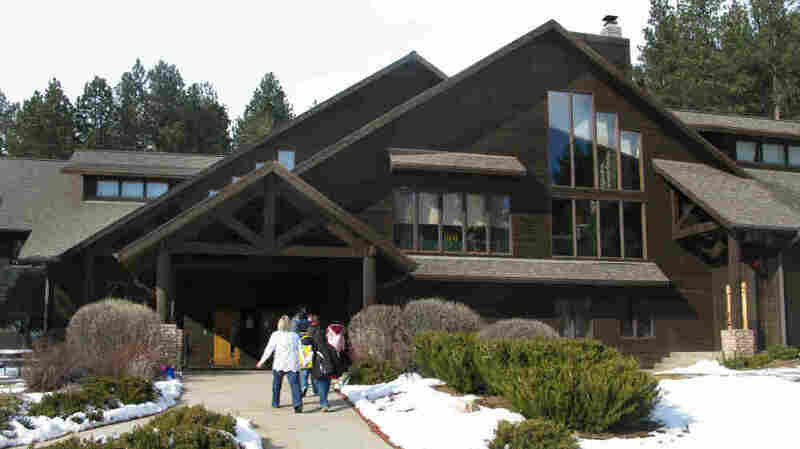 Troy Hoppes ran a group similar to Children's Home named Canyon Hills Center. He says he didn't know about many of the contracts until after they were given to Children's Home. "I just remember in the news there [were] some grants that were awarded, and obviously I was envious," he says. "We wanted to get some grants for ourselves, as well." Hoppes says his organization would have jumped at the chance to take on the additional work. "Facilities love the opportunity to branch out with things like that and give their staff opportunities to advance their skills," he says. In its statement, Daugaard's office said that any group home that has a license to care for children can be placed on the state providers' list and given children. But Hoppes says that they were on this list, yet the home struggled to fill its beds. At the same time, Children's Home had a waiting list. In his statement, Daugaard also emphasizes that the job of lieutenant governor was part time, and that he never supervised any of the people who approved the government contracts. State social services officials in their statement said Children's Home was never treated any differently from other organizations. Children's Home has won many state accolades for its work with children. But that doesn't mean much to Suzanne Crow or her granddaughter Brianna, who spent three years there. When Crow was a child, she was also taken from her family. She was sent to a boarding school. "Every night me and my sister would meet at her bed and would say, 'Let's run away tomorrow,' " Crow remembers. "We used to make all our plans just to comfort ourselves that we're still there. This foster care system reminds me of that." She didn't want Brianna to grow up like she did, not knowing who she was, not knowing that someone in the world loved her. It took a court order for the state to send Brianna home to her stepfather. "I didn't care what it took," Crow says. "I battled with them." State records show South Dakota paid Children's Home almost $50,000 over three years to care for Brianna. But across the state, grandmothers, aunts and uncles, family and tribal members would have cared for Brianna — and hundreds of other Native American children like her. They would have done so for free, keeping them close to their tribes and culture like federal law intended.